Compared to the simple timer with Attiny15 this timer is more accurate with a quartz to control the time. The time can be up to 99 hours and minutes and seconds can also be set. The range is from 1 second to 99h:59m:59s. I'm also using it to charge batteries or turn on a lamp for some time e.g. to make printed circuit boards. There are 4 pushbuttons to control the operation.. The start pushbutton starts the time, turns on the relais and the timer will turn off the relais when the time is elapsed. On the left is the reset button which will reset the timer and turn off the relais. The next is the start button, the display shows the programmed time in the upper line, 3 hours, 5 minutes and 12 seconds, and the lower line shows the time since the start button was pressed, 2 minutes and 44 seconds in this case and it shows that it is on. There is also a red led to show it's on. But first the time must be progammed. The next 2 buttons are used to do this. The ↔ button switches between programming hours, minutes and seconds and the inc button will increment the time. The display shows e.g. hrs on the upper right, then the inc button can increment the hours. The lower line shows the time since the unit was switched on and Off to indicate that the relais is off now. It should be mentioned that the inc button can only increment the time, if you set the time higher than wanted then press reset and start again. The circuit diagram, S4 is the reset button, and S3 is a pushbutton to start the timer. S1 and S2 will pull Int1 low through the diodes and in the interrupt routine the level on PD5 or PD4 determines which button was pressed., either the ↔ button or the inc button. On PD1 is a short signal when the time is elapsed, maybe could be connected to a buzzer, but I have not used it. PD6 is the timer output which is high when the timer is on, this turns on the transistor and the relais. Timing is controlled by the 4 MHz quartz crystal. 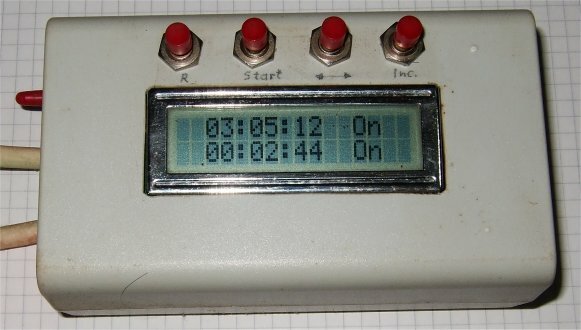 The timer in a box. 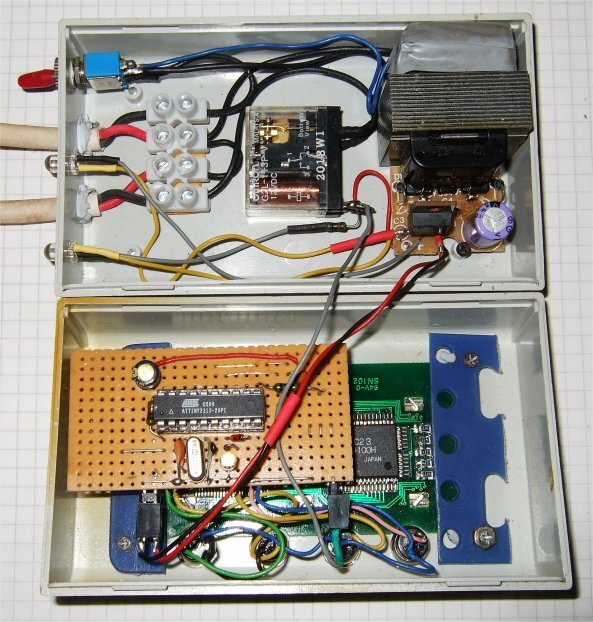 Above is the power supply and the relais and below the pcb with the Attiny2313 and the display board and the 4 pushbuttons. The parts count is low and not expensive to make. Useful to have a universal timer. Eine Leserfrage: Gerne würde ich das Projekt nachbauen. Doch schon das Compilieren des Quellcodes klappt bei mir nicht. Ich erhalte immer eine Fehlermeldung.